More than half of the station’s land area could be inundated by daily high tides later this century. 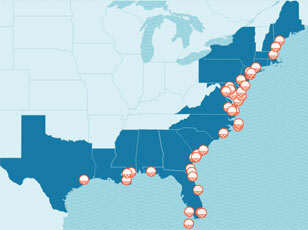 In the area of Dam Neck, seas are projected to rise between 4.5 and 6.9 feet by the end of this century. During the second half of the century, in the absence of preventive measures, this installation can expect more frequent and extensive tidal flooding, loss of currently utilized land, and substantial increases in the extent and severity of storm-driven flooding. Dam Neck is located on the Atlantic coast of Virginia, a region where natural subsidence, low-lying topography, and changing ocean circulation patterns contribute to above-average rates of sea level rise. The 1,100-acre station, which is part of the larger NAS Oceana, lies along the Atlantic coast and is five miles south of the town of Virginia Beach. Much of Dam Neck’s land lies less than six feet above sea level. The Navy’s pilots receive fleet combat and tactical training at Dam Neck. The station is also home to the Naval Special Warfare Development Group. Along with NAS Oceana and Naval Auxiliary Land Field Fentress, both located nearby, Dam Neck is responsible for generating more than $1 billion in goods, services, and payroll each year. The results below outline potential future flooding scenarios for NAS Oceana Dam Annex, assuming no new measures are taken to prevent or reduce flooding. 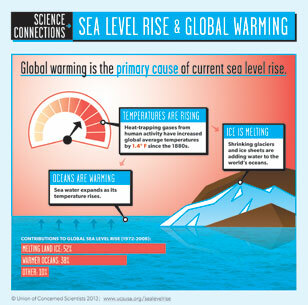 Sea level rise threatens to permanently inundate certain areas. 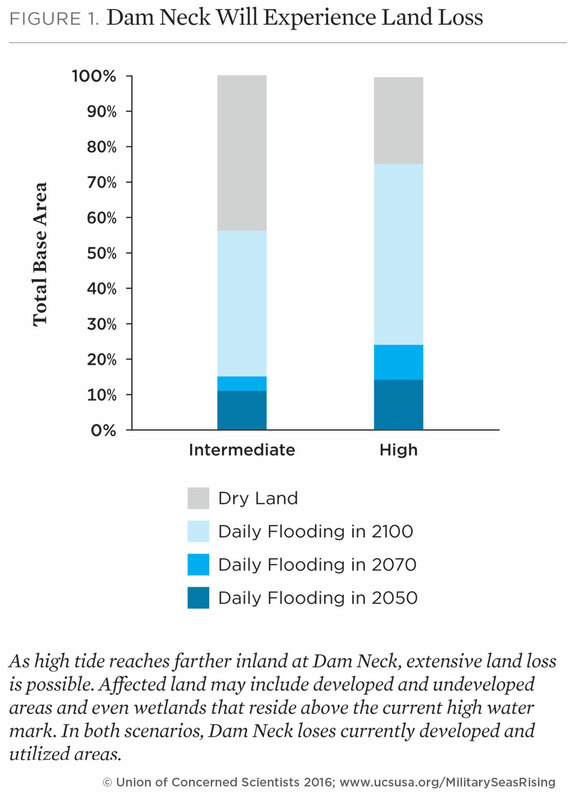 If the wetland areas of Dam Neck do not naturally adapt to rising seas, they could flood hundreds of times per year by 2050 in either scenario. In the intermediate scenario, these areas are underwater about 95 percent of the year by 2100; in the highest scenario, they are always underwater. Extensive land loss at Dam Neck is possible. The highest scenario projects 6.9 feet of sea level rise by 2100, which puts 75 percent of Dam Neck underwater during daily high tides—roughly equal to the area exposed to flooding by a Category 1 hurricane today. 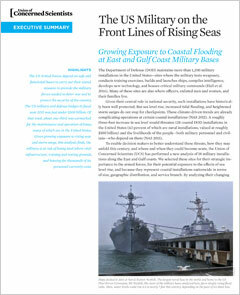 Sea level rise exposes previously unaffected areas of Dam Neck to storm surge flooding. Dam Neck is highly exposed to storm surge today, with roughly 75 percent of the station exposed to flooding during a Category 1 storm. By 2100, a Category 1 storm under either scenario exposes at least 95 percent of the station to storm surge flooding. Sea level rise exposes Dam Neck to deeper, more severe flooding. In an end-of-century worst-case scenario involving a Category 4 storm, nearly 60 percent of the installation floods to a depth of 20 or more feet. 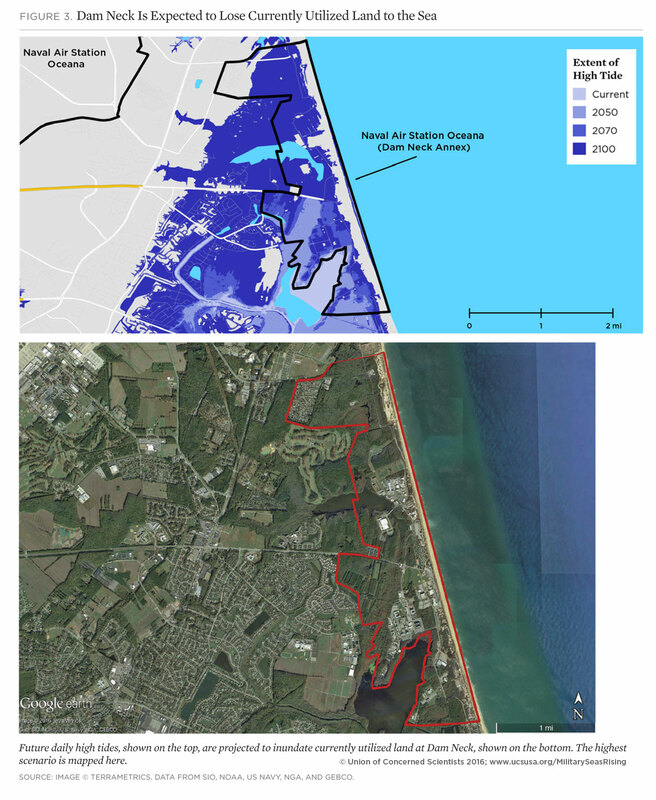 In order to plan effectively for the long term, military decision makers with authority over NAS Oceana and Dan Neck Annex need to understand how sea level rise may permanently alter the landscape of this coastal installation and where the threat of storm surge may become intolerable. To take action, however, installations like NAS Oceana and Dan Neck Annex will need more detailed analysis and resources to implement solutions. Marines, sailors, and local elementary school students participate in a beach run at Dam Neck Annex. In the backdrop is the mile-long engineered dune that is maintained to protect the inland infrastructure from storm surge. Detailed maps for each scenario at Oceana Dam Annex are available via Dropbox.